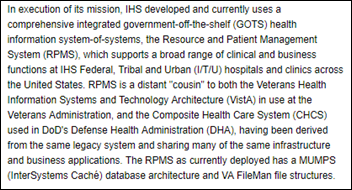 IHS’s RPMS is based on VistA. From Steve E: “Re: Stanford Children’s Hospital. The $1.2 billion facility is open and it’s impressive, with lots of technology. You should write a piece on it.” The expanded 361-bed building opened December 9. It’s a beautiful facility, as it should be for $3.3 million per bed. We take a different approach in the US in building elaborate campuses for which we all pay with no promises that outcomes will improve. 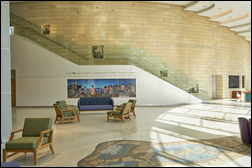 Patient satisfaction scores will rise because of amenities, although those aren’t any better of a predictor of long-term quality of life than impressive lobbies filled with crystal awards. I freely admit my cynicism about our profit-motivated healthcare non-system. The 82 percent of meeting attendees who sneak looks at their phones are most likely checking email or their calendar, although a few admit to being drawn to non work-related distractions such as news sites, Twitter, Facebook, Instagram, or Snapchat. THB says shiny object fascination is an addiction that can be cured only by confiscating everybody’s phone at the start of a meeting. Bored Amy observes that everybody at her company is so swamped that multi-tasking to keep up with email is mandatory, while MasterBlaster probes deeper into the “just in case you’re needed” meeting invitations where people are just sitting in the room on standby as the core meeting progresses just fine without their involvement. Too many meetings are held just because they are on a recurring schedule, often bloated with an ever-expanding roster of marginally involved attendees who can’t escape after being added to a single agenda and never removed from the list. There’s also the age-old meeting problems that make participation frustrating: nobody takes charge, there’s no agenda or action items, nobody puts a stop to pontificating and factless chatter, and specific to-do assignments are not made even though it’s assumed that the next meeting will be held on the appointed calendar day. In that regard, self-gratification by phone may be a reasonable defense mechanism. It may be that just getting together without a specific purpose adds value in keeping everyone updated, but the odds aren’t good. New poll to your right or here: which winter holiday do you consider to be your primary celebration? I’m happy to observe any holiday and I admit that I’m pleased rather than annoyed when someone wishes me Happy Holidays, Happy Kwanzaa, or Happy Anything Else instead of the traditional Merry Christmas — I’ll take all-too-rare best wishes from strangers any way I can get them. “Merry Christmas” is kind of weird anyway, grammatically speaking – when do we use the word “merry” otherwise? As a contrarian, I enjoy wishing people a John Lennon-style “Happy Christmas” just to stir them from their holiday coma with socialistic suspicion. An anonymous reader sent a donation to DonorsChoose, which with matching funds will provide math materials for the kindergarten class of Mrs. A in Black Creek, NC. I was binge-watching the engrossing “Halt and Catch Fire” on Netflix when I was struck by this strange but mostly unrelated fact, which I will present as a trivia question that you won’t get right without cheating. In what city was Microsoft founded, the same city in which Amazon’s Jeff Bezos was born? A newly submitted House bill would allow clearinghouses to sell patient data. Drug overdose deaths cause US life expectancy to drop for the second year in a row. Greenway Health files plans to lay off 120 of its Georgia-based employees in moving some functions to Tampa. I was curious about former Rep. John Fleming, MD — appointed early this year to the newly-created ONC position of deputy assistant secretary for health technology reform — since I have heard next to nothing about him. I emailed my ONC contact on Christmas Day and got a quick reply, which is either admirable or sad that both of us were keeping an eye on work email on the holiday. Fleming is leading workgroups on burden reduction, usability, and quality measures and I see he’s written some “Health IT Buzz” blog posts. There remains a great deal of confusion from self-professed digital health evangelists and conference bloviators who don’t grok how AI/machine learning actually works … I suggest learning how to code or teaming with someone who does. Build something, otherwise your prognostications are without merit. To my physician friends on the digital health speaking circuit: AI/machine learning is a science, no different than the courses you had in med school. Treat the field with the same deference … Consider redirecting time wasted on Twitter cutting and pasting articles about other people’s work toward building something useful. 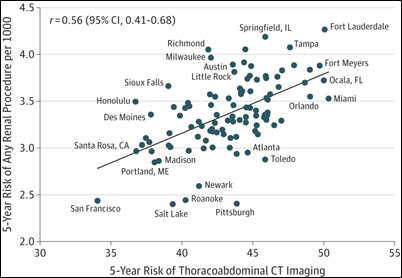 A study finds that excessive CT scanning turns up a lot of unrelated kidney tumors (“incidentalomas”) that are over-treated by removing the kidney, exposing the patient to more harm than benefit. This is yet another example of where our excessively fine-tuned diagnostic capabilities (which are getting more sophisticated by the minute as technology such as AI advances) lead clinicians down an expensive and sometimes patient-endangering rabbit hole. We need proven, affordable prevention and treatment strategies for already-detectable and clinically meaningful conditions, not companies that are anxious to profit from the consumer misconception that new diagnostic capabilities will improve societal health. Only outcomes matter. We could also use one where just being exposed to it carries its own significant danger via medical errors, overtreatment, and a frequent disconnect between science and practice. Tanmay Bakshi, a 14-year-old IBM Watson programmer, is convinced of the value of AI in healthcare. He’s working on a project to help a disabled woman communicate through a neural network that models her brain. He developed his first IOS app at age nine, has published 150 YouTube videos to teach young people about technology, consults with major corporations, and has delivered keynote and TEDx presentations. Stanford, while b.e.a.utiful … has built and ediface? Per-amid? … A giant phallic symbol? … imagine how many more ppl you’d help if you push that care out to every corner of San Francisco … that’s 60 $20m facilities …. ~3 per zip code? In the early days – Microsoft was founded and HQ out of Albuquerque. I don’t know if Bezos is from there. He is, so you get credit. People often forget that Microsoft started out in Albuquerque to work with Altair PC manufacturer MITS in 1975. The company moved to Washington for several reported reasons: (a) better access to talent; (b) Gates was from there; (c) the company was working with another partner there; and (d) Gates wanted employees to be stuck indoors looking at gloomy rain outside instead of being tempted away by endless blue skies, vistas, and recreational opportunities. I had Sumbal Desai the person then at Stanford Hospital (now at Apple) responsible for this new initiative on a panel back in 2013 or 2014. She waxed on about how it wasn’t all about building $3bn medical center palaces but that Stanford was going to create primary care centers in underserved communities to tackle their problems with access, chronic care management et al. I asked her where that first clinic would be and she said Portola Valley! You can imagine my response was a tad cynical. I’m anxious to see their quality scores and the general health of their local population rocket after being held back for years by lackluster architecture. 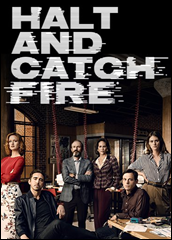 Two thumbs up for Halt and Catch Fire. Feels like he’s getting bored of the job now that his buddy Tom Price was removed. Orlando’s comments could be extended to most health IT topics at most conferences these days. In my opinion, you can’t be a “thought leader” or “futurist” on a topic unless you’ve actually experienced implementing it in the present state. Anyone can opine about a possible future if they’re not bogged down trying to get things to work in the current one, and frankly it’s easier because you’re not anchored to reality. Unfortunately, for-profit conferences are as common and useful as throwaway journals these days. He reports to the assistant secretary? Is there an assistant secretary that is second in line to the deputy secretary? Is there an associate secretary somewhere in this mix? A title this insane and nonsensical can only point to a job that wasn’t needed in the first place. Welcome to Republican small government I guess. Wait until you encounter the “Subdeputy Administrative Assistant Undersecretary”!